Cars queued up at a Gulf station in Fort Lee, N.J., on Thursday. 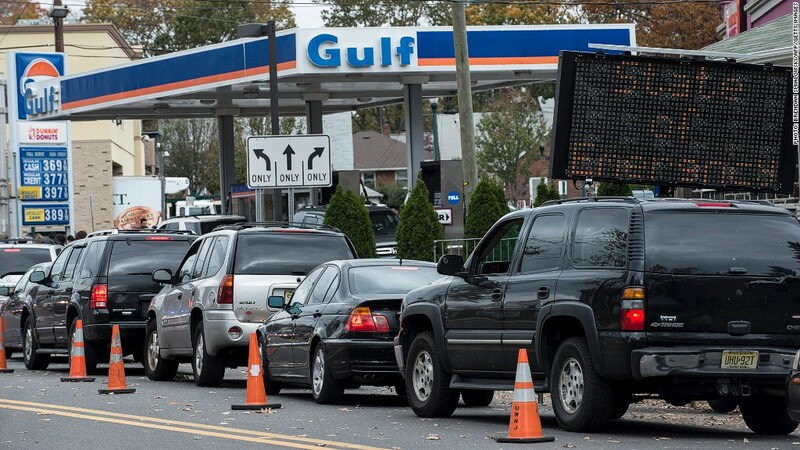 Long gas lines have formed in New Jersey and New York, and many stations are without power from Superstorm Sandy. Many of the gas stations in the New York City region were still out of commission Friday due to the effects of Superstorm Sandy, and long lines continued to form at the stations that are still operational. Millions of people were still without power from the fatal storm that made landfall on the Jersey Shore and plowed through the Northeast on Monday. This has affected gas stations, which cannot pump gas without electricity. Only 40% of the 2,944 gas stations tracked by AAA in New Jersey have power and are operational, according to Robert Sinclair, New York spokesman for the motorist group. He said only 35% of the 1,472 gas stations tracked by AAA on New York's Long Island are operational. In New York City, AAA says about 35% to 40% of the stations are operating. Gas stations that still have power and gas are marked by long lines of cars -- and also pedestrians with jerry cans - to keep running the generators that power their homes. 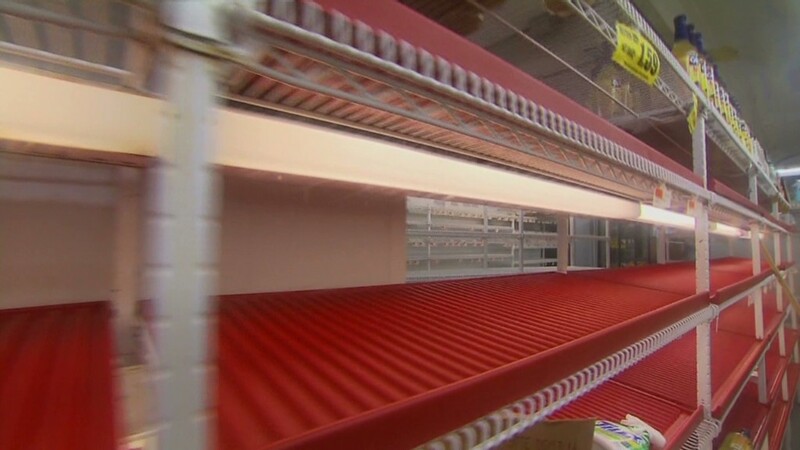 New Jersey residents have told CNNMoney that the elderly and very young are especially dependent on generator gas for heat. Sometimes long lines form, only to have drivers turned away after the stations run out of gas. "I was down in Sayreville [N.J.,] four cars away [from the gas station] when they ran out of gas as people walked away with a bunch of full canisters," a physical therapist told CNNMoney on Thursday. Some lines in New Jersey stretch for miles, with police officers on hand to maintain order, using yellow tape and traffic cones to corral customers into organized lines. In New York's borough of Queens, police say they arrested a man after he allegedly cut a gas line and then pulled a gun on another customer who confronted him. Matt Smith, analyst for Summit Energy Services, said gas shortages could stretch through the end of next week and possibly into the week after that. The one bright bit of news, from the perspective of consumers, is that gas prices haven't increased that much -- when they've increased at all. Gas prices continued their downward slide nationwide, declining 1.1 cents to an average of just below $3.50 per gallon of regular. Gas prices usually decline in the fall, as demand drops off following the busy summer vacation season. But prices in the storm-affected areas were on the rise, if only slightly. The statewide average for New Jersey rose 1.1 cents to just below $3.56 for a gallon of regular, according to AAA. New York's gas prices edged up by less than 1 cent statewide to nearly $3.94 per gallon. "It's somewhat of a conundrum," said Smith of Summit Energy Services. He said that gas stations "are not allowed to get involved in price gouging, although given the extraneous circumstances, you would still expect this to occur to some extent." But Smith said the only modest price increases in the affected areas are more likely the result of gas being sourced from areas that were not hit by the superstorm. "U.S. gasoline demand is seeing seasonal weakness on a national scale, so the product being sent into the Northeast is from areas in the U.S. where there [are] neither supply constraints nor high demand," he said. Most major gas station chains, from Exxon Mobil Corp (XOM) to Hess Corp (HES), were experiencing disruptions. Supply problems stem from closed refineries as well as infrastructure issues with the ports and also fuel trucks stymied on the crowded highways. A pipeline supplying gas from the Gulf of Mexico was out of commission from power loss, but was expected to be back on line Friday. AAA did not have data for New York City, though large swaths of the city were still without powern Friday. The skyline of lower Manhattan, from 42nd Street all the way down to the southern tip of the island, has gone dark, and residents and businesses are struggling. Most of the subway system is not functioning because of power loss and flooding, placing further pressure on the gas supply because fewer people are using public transportation. Other sections of the city -- including Staten Island, Queens and coastal sections of Brooklyn such as Coney Island -- were without power and many homes have been destroyed by high winds, fires and floods. Coastal sections of New Jersey -- particularly Seaside Heights and Atlantic City -- bore the brunt of the catastrophe. Sections of Connecticut are also in the dark.